Despite my actual knowledge of The Blue Nile being limited to one brief listen a long time ago to the university library copy of Hats, look what I picked up the other day. 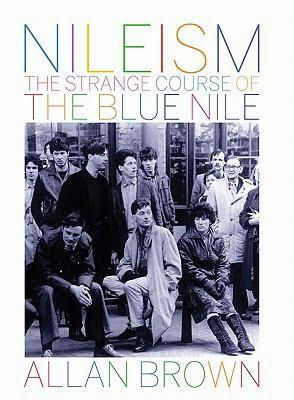 I bought Nileism - which is a cut above the usual music biography, by the way - more for the legend of The Blue Nile than anything else: twenty years existing in Glaswegian shadow, punctuated by only four albums and minimal touring. With minimal participation from the three core band members Paul Buchanan, Robert Bell and P J Moore, Brown struggles to shed much light on their notoriously hermetic and glacially slow musical processes. So inevitably the book does talk a lot about the recordings themselves. Yet in spite of this - and this is very much a tribute to the author's skill - what Nileism does deliver on is in providing a near-textbook example of the tricksy nature of creativity and the interdependency of method and results. The partnership of Buchanan, Bell and Moore, plus studio owner and engineer Calum Malcolm as enabler and facilitator, seem to have achieved painstakingly slow but successful results over the first two albums. They formed what Brown describes, speculatively but science-fictionally, as a hivemind: a joint approach rooted in what he suggests was an uncommonly close working relationship, a sympathetic recording studio, a strong sense of place in the city of Glasgow and a record deal which firewalled them from the demands of the mainstream music industry. When after album two these conditions gradually changed, Brown reckons, everything slowly expired: the musical results, the friendships and finally the band itself. Of course it didn't help that none of The Blue Nile seemingly talked out their problems, but the point of this nearly-but-not-quite-a-review is to stress how important understanding your creative eco-system is for your art. Change any one factor and you risk disturbing the foundations of what you've built. Change nothing, of course, and you risk stagnation. But that's a whole different story.